This article is about The Old Testament figure Benjamin, son of Jacob. For people named Benjamin, see Benjamin (name). For other uses, see Benjamin (disambiguation). Benjamin was the last-born of Jacob's thirteen children (12 sons 1 daughter), and the second and last son of Rachel in Jewish, Christian and Islamic tradition. He was the progenitor of the Israelite Tribe of Benjamin. In the Hebrew Bible unlike Rachel's first son, Joseph, Benjamin was born in Canaan. In the Samaritan Pentateuch, Benjamin's name appears as "Binyaamem" (Hebrew: בנימין, "Son of my days"). In the Qur'an, Benjamin is referred to as righteous young child, who remained with Jacob when the older brothers plotted against Joseph. Later rabbinic traditions name him as one of four ancient Israelites who died without sin, the other three being Chileab, Jesse and Amram. According to the Hebrew Bible, Benjamin's name arose when Jacob deliberately corrupted the name Benoni, the original name of Benjamin, since Benoni was an allusion to Rachel's dying just after she had given birth, as it means son of my pain. Textual scholars regard these two names as fragments of naming narratives coming from different sources - one being the Jahwist and the other being the Elohist. The etymology of the name interpreted as son of the right side. Being associated with the right hand side was traditionally a reference to strength and virtue (cf sinister, which derives from the latin for left). This is, however, not the only literal translation, as the root for right is identical to that for south, hence Benjamin also literally translates as son of the south. This meaning is advocated by several classical rabbinical sources, which argue that it refers to the birth of Benjamin in Canaan, as compared with the birth of all the other sons of Jacob in Aram. Modern scholars have instead proposed that, with the eponymous Benjamin being just a metaphor, son of the south / son of the right are references to the tribe's being subordinate to the more dominant tribe of Ephraim. Inside the Samaritan Pentateuch, the name is consistently written as בן ימים, with a terminal mem, making it Benjamim, and would literally translate as spirit man. Some classical rabbinical literature argues that this was the original form of the name and was a reference to the advanced age of Jacob when Benjamin was born. 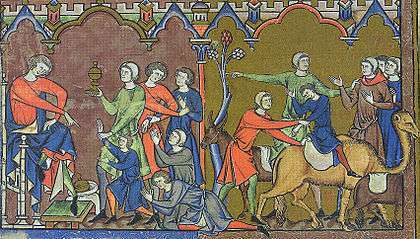 Illustration from the Morgan Bible of Benjamin being returned to Egypt (Genesis 44). The Torah's Joseph narrative, at a stage when Joseph is unrecognised by his brothers, describes Joseph as testing whether his brothers have reformed by secretly planting a silver cup in Benjamin's bag, then publicly searching the bags for it, and after finding it in Benjamin's possession, demanding that Benjamin become his slave as a punishment. The narrative goes on to state that when Judah (on behalf of the other brothers) begged Joseph not to enslave Benjamin and instead enslave him, since enslavement of Benjamin would break Jacob's heart. This caused Joseph to recant and reveal his identity. The midrashic book of Jasher argues that prior to revealing his identity, Joseph asked Benjamin to find his missing brother (i.e. Joseph) via astrology, using an astrolabe-like tool; it continues by stating that Benjamin divined that the man on the throne was Joseph, so Joseph identified himself to Benjamin (but not the other brothers), and revealed his scheme (as in the Torah) to test how fraternal the other brothers were. However, some classical rabbinical sources argue that Joseph identified himself for other reasons. In these sources, Benjamin swore an oath, on the memory of Joseph, that he was innocent of theft, and, when challenged about how believable the oath would be, explained that remembering Joseph was so important to him that he had named his sons in Joseph's honour; these sources go on to state that Benjamin's oath touched Joseph so deeply that Joseph was no longer able to pretend to be a stranger. 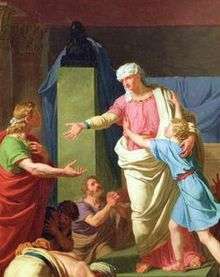 In the narrative, just prior to this test, when Joseph had first met all of his brothers (but not identified himself to them), he had held a feast for them; the narrative heavily implies that Benjamin was Joseph's favorite brother, since he is overcome with tears when he first meets Benjamin in particular, and he gives Benjamin five times as much food as he apportions to the others. According to textual scholars, this is really the Jahwist's account of the reunion after Joseph identifies himself, and the account of the threat to enslave Benjamin is just the Elohist's version of the same event, with the Elohist being more terse about Joseph's emotions towards Benjamin, merely mentioning that Benjamin was given five times as many gifts as the others. The Qur'an, in the narrative of Joseph, refers to Benjamin as the righteous youngest son of Jacob. Islamic tradition, however, does not provide much detail regarding Benjamin's life and refers to him as being born from Jacob's wife Rachel, and further links a connection, as does Jewish tradition, between the names of Benjamin's children and Joseph. 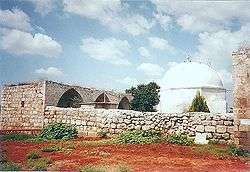 Exterior view of a Mamluk Caravanserai complex, including the mausoleum of Nabi Yamin, traditionally believed to be the tomb of Benjamin, located outside Kfar Saba, Israel. Biblical scholars regard it as obvious, from their geographic overlap and their treatment in older passages, that originally Ephraim and Manasseh were considered one tribe, that of Joseph. According to several biblical scholars, Benjamin was also originally part of this single tribe, but the biblical account of Joseph as his father became lost. The description of Benjamin being born after the arrival in Canaan is thought by some scholars to refer to the tribe of Benjamin coming into existence by branching from the Joseph group after the tribe had settled in Canaan. A number of biblical scholars suspect that the distinction of the Joseph tribes (including Benjamin) is that they were the only Israelites which went to Egypt and returned, while the main Israelite tribes simply emerged as a subculture from the Canaanites and had remained in Canaan throughout. According to this view, the story of Jacob's visit to Laban to obtain a wife originated as a metaphor for this migration, with the property and family which were gained from Laban representing the gains of the Joseph tribes by the time they returned from Egypt; according to textual scholars, the Jahwist version of the Laban narrative only mentions the Joseph tribes, and Rachel, and does not mention the other tribal matriarchs whatsoever. For a list of persons with the given name Benjamin see All pages beginning with "Benjamin"
The Jewish Encyclopedia, 1908: Benjamin. Material on the tribe, its territory, Rabbinical tradition and Islam.